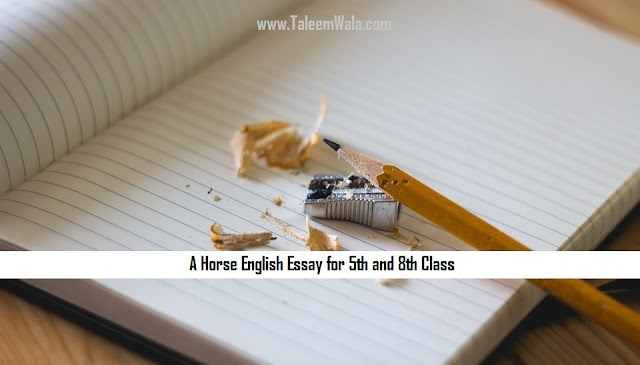 Read and download this original and by teachers note on A Horse English Essay for 5th and 8th Class for students in Pakistan. You can recommend this essay to students and kids in classes of primary and middle education levels all over the Pakistan. A horse is a swift and vigorous animal. It is found everywhere in the world. It has many species. It is widely kept as a pet in different countries. It may be brown or white or grey or black in colour. It has mane on its neck. It runs very fast. It is also said to be a beast of burden. People take many jobs from it. It is used to pull the carts. It was also used for warfares in the past. It used to be the royal conveyance of the Kings and Queens in the past. But now, bicycles, ships, cars, buses and aeroplanes have replaced it. It is a herbivore and mainly feeds on fresh grass, leaves and fodder. It loves to eat roasted grams. Its legs are very strong. It is also tamed and well trained to work in the circus where it shows different exciting feats in order to amuse the spectators. It is a very productive and faithful animal. It recognizes its owner well. It is also used in different sports and games like Polo, Horse Riding, Horse Race etc. Many people keep it as a pet animal. It is really a useful animal. To get more English essays on different topics stay connected and search on our website (www.TaleemWala.com).